In the final scene of “Kung Fu Panda 2,” we were teased with a glimpse of a panda village where our hero Po’s long-lost father, Li, is living. Five years and nearly 600 artists later, that village is fully realized, and has become the 8th wonder of the world. 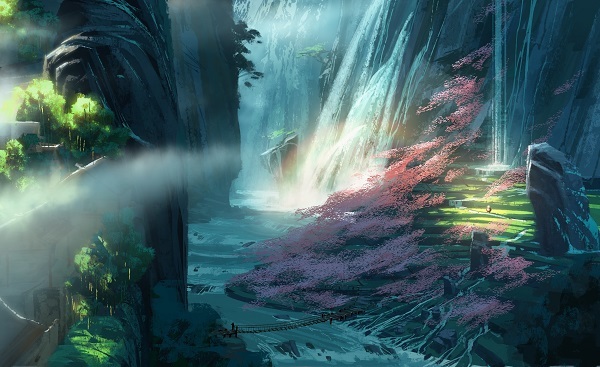 As the visual development images show, Li’s home is a stunningly majestic and picturesque world. It’s a living paradise that mixes ancient Chinese architecture with the pure beauty of nature. “Kung Fu Panda 3” is the first co-production between DreamWorks Animation and the Shanghai-based studio, Oriental DreamWorks. The alliance has brought a striking level of detail and authenticity to this panda Shangri-La. Looking to China's gorgeous natural wonders for inspiration, the creative team took a 10-day trip to Qingcheng, part of the Sichuan province, to soak up the ambiance. “If you’ve ever dreamed of being surrounded by baby pandas, this is where it is!” says Jennifer. Returning to the States with terabytes of exquisite images, both the U.S. and Chinese teams began creating a digital 3D panda village. The fantastical world could then be explored with a virtual camera. “It was a huge technological leap from the first film,” adds Jennifer. “Kung Fu Panda 3” arrives in theaters on March 16, 2016 from DreamWorks Animation and 20th Century Fox to be distributed by Warner Bros.